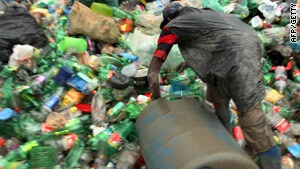 A man picks bottles for recycling at the Jardim Gramacho landfill site in Brazil. (Reader's Digest) -- What causes the greatest amount of "green guilt" across the globe? Not recycling enough was the number one response in 9 out of 15 countries surveyed, followed by wasting water. A new global "Around the World" poll, conducted by Reader's Digest and published in all of its 50 April editions worldwide, found that Brazil was the country where the largest number (42 percent) polled said they feel guilty about not recycling enough, followed by Malaysia and Russia (both 40 percent), China and the Netherlands (both 35 percent), and France (31 percent). The United States and the Philippines (both 30 percent) ranked below them. The most guilt in the survey was felt by the water-worried Spaniards. Cosme Ojeda, editor of Reader's Digest Spain, says, "In our arid country, we are all aware of the lack of water every day." India (39 percent) and Italy (30 percent) ranked behind them, but it was also their biggest concern. Cristian Arratia, 28, of Blue Mountains, Australia, told the magazine, "I do stupid things like running the tap while I brush my teeth." The United States, which has the highest number of motor vehicles per capita of any nation on earth (844 per 1,000 people), also felt guilty about driving too much, according to 30 percent of Americans polled. Fran Musetti, 58, of Clovis, California, said, "Our society has become too rushed, and that's why we drive everywhere."